Economic “slack” refers to unused resources. Slack matters because estimates of slack then shape economic policy that affect interest rates and markets – and your returns. The problem is that typical measures hide its size. Digging into the data reveals a more dramatic story. Slack of some amount is good for central banks because it means an economy can grow without fear of inflation. Equipment is about technology, but dicey to measure at broad levels because it is difficult to roll-up all the improvements in specific equipment. Equipment is increasingly abundant; even slow to assemble items (airplanes, generators and mining equipment) have ample capacity. Structures and labor slack are most important to estimate because of their human impact and magnitude. Labor hours worked per person is more insightful than counting “employed persons” who only had to work at least one hour in a week to be counted. Hours worked moves the ratio more than population because hours are more variable. 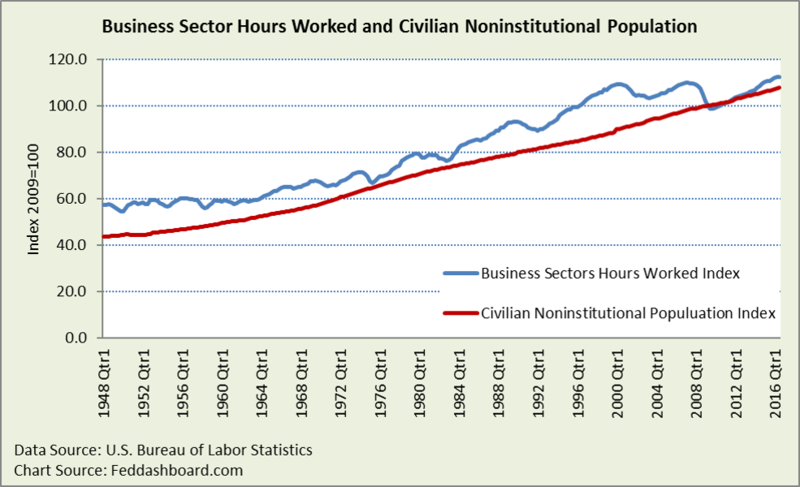 The ratio illustrates today’s hours worked are 20% less than in 1948. However, noticeable uptrends include from 1982 to 1999 and since 2009. 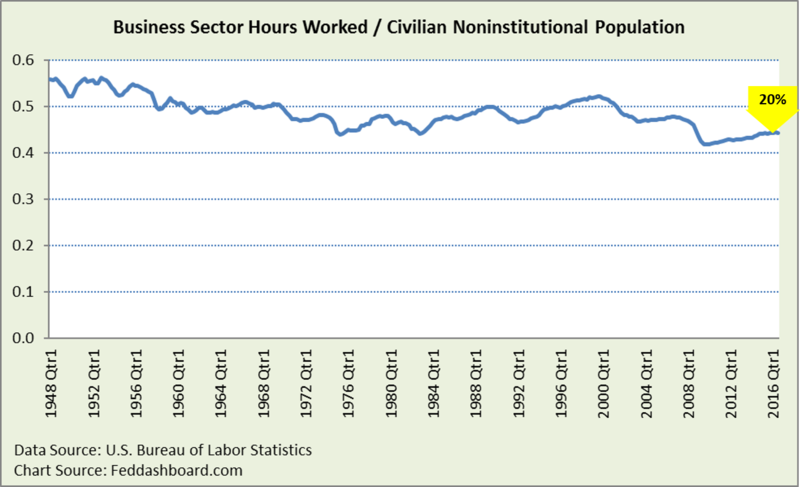 Since 1987, when the ratio was relatively low, we’re working 7.5% less hours. Measuring “per person” as people paid in a week, then the U.S. Bureau of Labor Statistics (BLS) measure of average weekly hours worked is down about 17% since 1948. 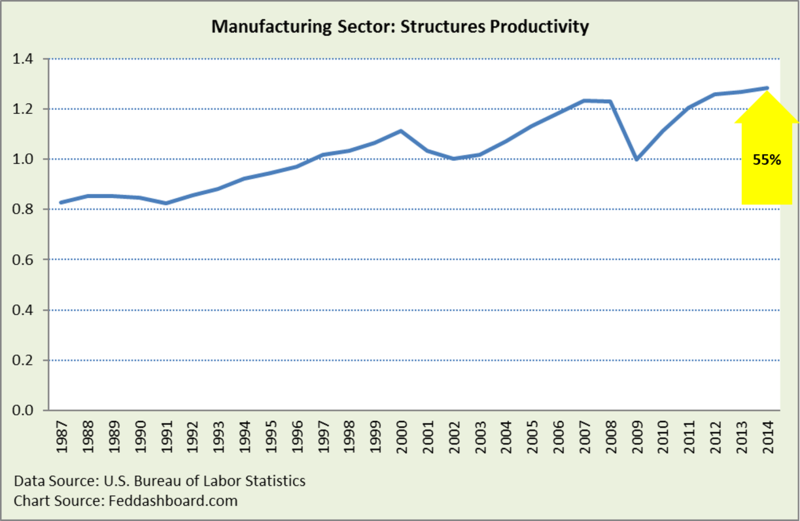 Due to productivity growth, far more production is available today from hours worked. Of course, any ratio has its limits. For example, this ratio doesn’t reflect skill available from people who are over-qualified for their jobs or age distribution changes in the population. Output potential from structures (buildings) is seen in how much output growth has already come from structures. BLS data is quite detailed for manufacturing starting 1987, so we’ll focus there. 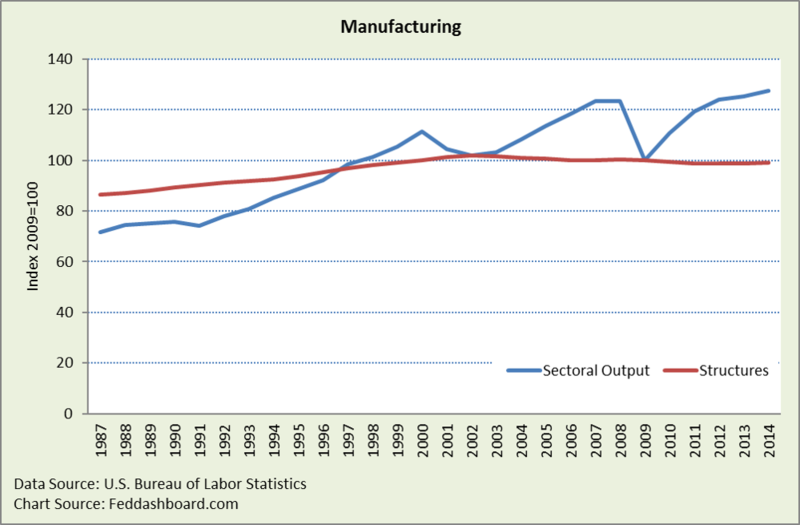 Manufacturing output (production) moves the ratio more because it is more variable. Structure productivity is output divided by structure inputs. The tough parts of the available structures estimate are the depreciation and efficiency rates. For example, consider how “old” buildings have zoomed back to life. Poster children are pre-WWII decommissioned military bases that are now dynamic high tech parks – from Brooklyn’s Navy Yard to Silicon Valley’s Moffett Field home to NASA Ames Research, Singularity University and Google airplanes. Finding purposes for developed country resources is about more than pumping up domestic demand, especially given high debt levels. It’s about creating conditions for trade and development in the global south.